There are not many professions where you get to wake up every day and taste the fruits of your labor… literally! 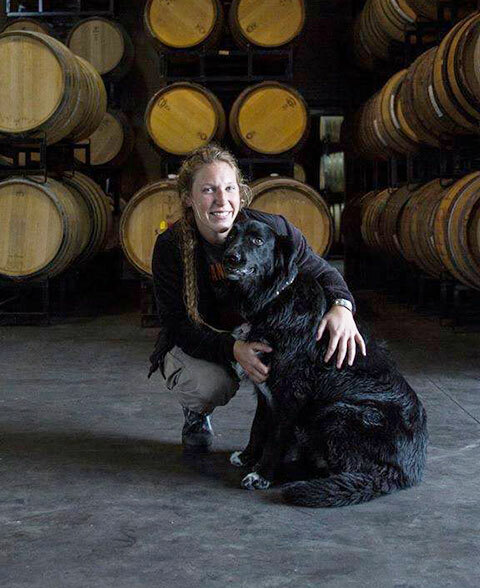 Ari knew she wanted to become a vintner when she attended a viticulture class in college. 3 years officially, but I have been helping in the family winery for many more. I guess you could say I was born in to it…as my Dad, Stuart Spoto, and my grandfather, Henry, both taught me. I didn’t have an “a-ha” wine, more of an “a-ha” moment. I attended Cal Poly San Luis Obispo, and I didn’t know what I wanted to do when I grew up. My Grandfather told me to take a wine and viticulture class; I didn’t think I would really want to study it, but I humored him anyway. I walked into the classroom, which was more of a tractor garage than a classroom, and saw my peers in flannels and cowboy boots without book bags. The teacher arrived and said, “Alright, were heading out to the vineyard.” From there, we proceeded to follow Cal Poly’s motto of Learn by Doing with a full hands-on approach to learning viticulture and enology. After that, I was hooked; I changed my major, and knew wine was the route I wanted to take. There are not many professions where you get to wake up every day and taste the fruits of your labor… literally! This job is rewarding in the sense where you get to see how your hard work pays off and make something that most people enjoy. Punch downs, tank digs and pulling hoses around the winery. Spoto Family Wines is a family business and has become multi-generational. My grandfather started making wine over 50 years ago and has passed along the tradition to my father. I was lucky enough to have interest in the industry and hope that one day my children can carry on the tradition. Traveling the world as a poor hippie. Start wherever you can and move up from there. It’s hard to get started, but once you establish yourself, you’ll be very pleased with your hard work.